Now seems a good time to take stock of what is in the real GDP series, since 2nd quarter 2010 National Income Accounts data were just released, and there was a substantial revision to previous estimates. Following a time-honored macro tradition, I'll look at different approaches to separating the trend in the data from cyclical behavior, and see what that tells us. One approach to detrending time series is the Hodrick-Prescott (HP) filter. If you don't know how to do this, the HP filter actually has its own Wikipedia entry. HP filtering basically fits a time-varying trend to the data, and there is a parameter you can set that governs the smoothness in the trend. 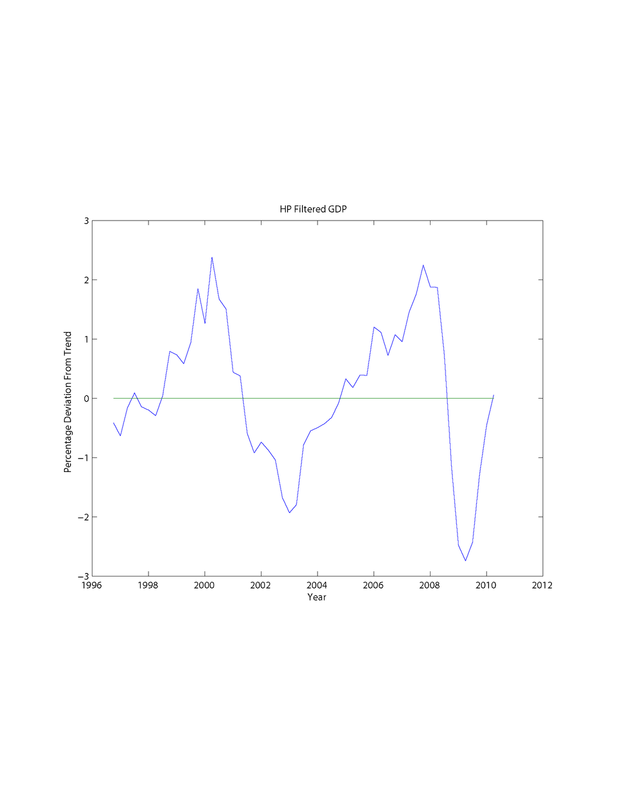 Here is a picture of the HP-filtered US real GDP data. The HP filter tells us that the most recent turning point was a deviation from trend which was not much more severe than the last one, which occurred in first quarter 2003. Further, the current deviation from trend is zero - the recession has been and gone. Of course this does not agree with how anyone seems to be thinking about recent history. What is going on? The next chart shows you the raw data: the log of real GDP and the HP trend. The HP filter is agnostic - it doesn't know economics and it has no axe to grind. It wants to see a decrease in the trend rate of growth to fit the data - indeed, the current rate of growth in the HP trend is close to zero. I certainly cannot say that the HP trend is the efficient path for aggregate output, but neither can I say it is not. Indeed, Kydland and Prescott were willing to write down a model in which they argued that the deviations from the HP trend could be characterized as efficient. 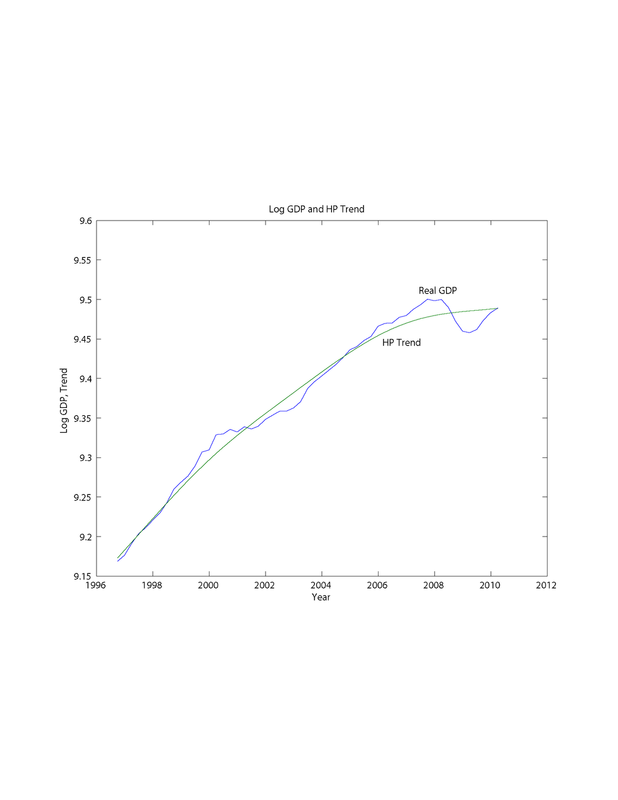 Now, what if I take another approach to thinking about the trend in real GDP? A remarkable feature of per capita real income for the United States is that the time series, going back more than 100 years, does not deviate much (excluding the Great Depression and World War II) from constant trend growth of about 2% per annum. 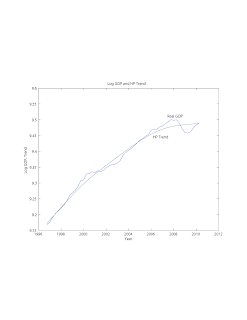 The standard growth theory we use in macroeconomics will give us this type of growth path if total factor productivity (TFP) is growing at a constant rate. This is somewhat reassuring, though we are not too solid on why TFP should be growing at a constant rate in the most technologically advanced country in the world. If I fit a linear time trend to the log of real GDP for the post-World War II period in the United States, I get the following picture, where I am just showing the most recent data (though the trend was fit for the period 1947Q1-2010Q2). This chart gives us a different perspective relative to the last one. The trend growth rate in the post-World War II data was 3.28% per annum. From 1998 until late 2001, real GDP was above this trend, but has been below it since. Indeed, the difference between the trend and actual GDP begins to widen well before the onset of the most recent recession, and the current deviation is huge. How huge? 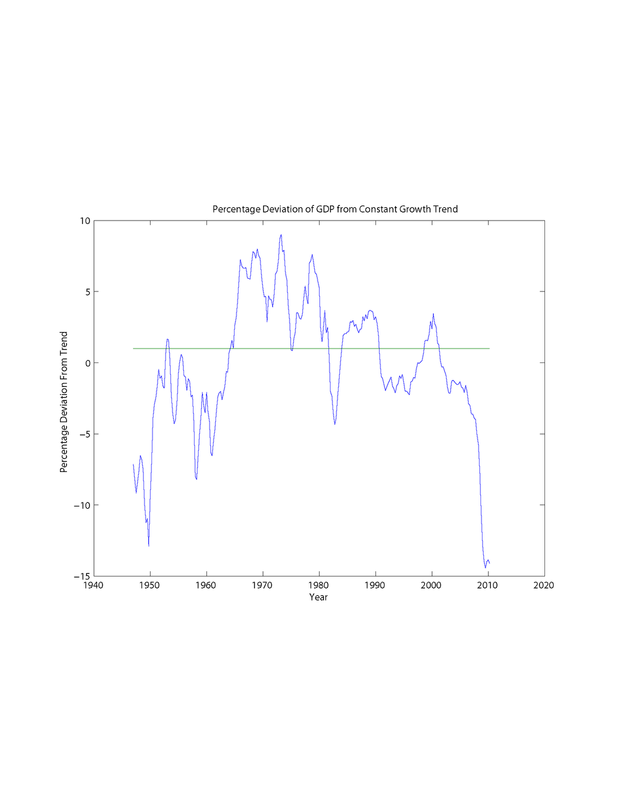 The next chart shows the percentage deviation of real GDP from a constant-growth trend. The current negative deviation is the largest we have seen in the post-WWII period - just short of 15%. 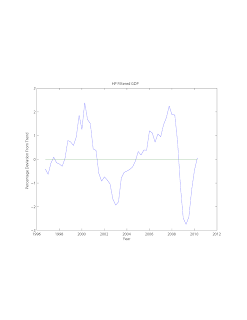 Relative to previous experience, it's not impossible that real GDP could sometime return to the 3.28% growth trend line. 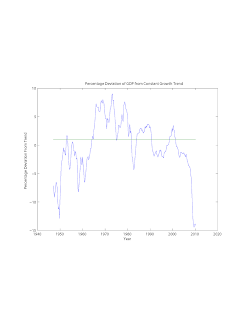 This obviously requires a long period of sustained growth greater than 3.28%, but such growth rates were experienced in the early 1950s and in the 1960-1970 period. But what if the US economy and the position of the US as a World technological leader has changed dramatically? Given the negative deviation of real GDP from the constant-growth trend during much of the last decade, we could think of that period as a period of depressed growth, where we never made up for what we lost in the 2001 recession, and then lost some more. Note in particular that GDP growth was buoyed up in 2000-2006 by the construction of houses which we had no business building. Once the housing sector fizzled, growth stagnated, and we all know what followed that. Now, it is very important that we determine exactly what our future long-run growth prospects are. Is our long-run growth rate going to be lower than it was in the past? Will we ultimately converge to a growth path that is below the post-WWII trend but with roughly a 3.28% growth rate? Are there important inefficiencies in the US economy that are impeding growth (housing and mortgage market intervention and subsidies for example)? If so, we should figure this out, and do something about it. My worry is that we are too focused on the last month's retail sales numbers, or last quarter's GDP report, and what the federal government or the Fed can do to "solve" short-run problems. We are not paying enough attention to what really ails us. You seem to be assuming that the long-run problem is separate from the short-run problems. But what if the long-run problem is actually being caused by the short-run problems? My own view is that the dramatic growth recession of the past 10 years is a demand-side phenomenon (possibly induced by Chinese policy, as Adam P of Canucks Anonymous argues). The HP filter's estimate of the trend is not very reliable at the endpoints of the sample. This is one of the costs of being flexible about the shape of the trend--the trend estimate for 2010Q2 gives a very large weight to the 2010Q2 estimate of GDP. It will take a couple of years before the HP method gives a more or less stable estimate of the trend for 2009 and 2010. I predict that the HP filter's estimate of the size of the recession, as well as the distance between GDP in 2010Q2 and its trend value, will grow as we get more data. Yes, exactly. I know some people make an endpoint adjustment to counter this effect, but I don't have a reference. One approach would be to put in a forecast for 2010Q3 and beyond, and then filter. Congratulations for this excellent blog! After China joined the WTO in 2001, the industrial base of allmost all the "industrialised" countries has changed, and now we will be depending more of a "real" economy than in the past (fiduciary money is gone for a longtime), and how we can add value with almost devastated industrial base? You always try to use all of the important data, facts, evidence, at your disposal, with rock solid logic applied to it that's ultimately – in the end – anchored to reasonable assumptions, if you want to optimize your decisions, not just very formal, blunt, heavily assumptioned statistical data and methods, or method. With the case of our children there's far more important data that can be added, like biological limits and my wife's current age put a limit on the number of children we can have that's far lower than 46. With the case of the HP filter on a tiny amount of years, you write, "I certainly cannot say that the HP trend is the efficient path for aggregate output, but neither can I say it is not." Maybe you cannot say it's not with perfect 100% certainty (given your assumptions about the world), but given that that path is going to zero growth very quickly and staying there, I think with just the mildest of assumptions (what I see is actually there, and not much stronger), and just very basic knowledge of the state of science, computers, robotics, genetics, etc., and all of the great advance that's very attainable (robots building robots, super plants, cheaper solar) if we plug away just anywhere close to reasonably efficiently, you can say that the probability of not eventually going beyond your HP path of GDP in the long run is virtually zero. And, if we're concerned about long run growth we should have the government spend far more on high return investments of the kind the pure free market will grossly under provide and/or inefficiently provide due to externalities (especially ginormous positional/context/prestige externalities), the zero marginal cost of ideas/information, asymmetric information, etc., etc. These investments include alternative energy, education (like free universal pre-school and bachelors degree; how long have we been stuck at only free K-12? 100 years? Do you think the need for education has increased in that time? ), basic scientific and medical research, infrastructure, etc. This would be a fantastic way to employ many of the unemployed, and it's not like we should wait for the pure free market to employ them in an "efficient" way (how long will this take? a decade? more?) because the pure free market is highly inefficient due to externalities, etc. We can obtain far more total societal utility for this generation and future ones with a strong government role, especially one which shifts us away from consumption, heavily of the largely zero-sum-game positional/context/prestige externality type, and into high return investment. In evaluating different models of growth, I have found Lucas's (1988) observation, that people with human capital migrate from places where it is scarce to places where it is abundant, is as powerful a piece of evidence as all the cross-country growth regressions combined. But this kind of fact, like the fact about intra-industry trade or the fact that people make discoveries, does not come with an attached t-statistic. As a result, these kinds of facts tend to be neglected in discussions that focus too narrowly on testing and rejecting models. My greatest regret is the shift I made while working on these external effects models...I suspect I made this shift toward capital and away from knowledge partly in an attempt to conform to the norms of what constituted convincing empirical work in macroeconomics. No international agency publishes data series on the local production of knowledge and inward flows of knowledge. If you want to run regressions, investment in physical capital is a variable that you can use, so use it I did. I wish I had stuck to my guns about the importance of evidence like that contained in facts 1 through 5. – Journal of Economic Perspectives, Volume 8, Number 1, Winter 1994, Page 20. Can you discount major structural changes to the economy because of global resource depletion? I'm not sure we know the answer yet, but a case can be made that the century of 2% per capita growth is coming to a close. In the post WWII era, there is a fairly significant reduction in US GDP roughly coincident with the oil shocks in the late 70's. Comparing the thirty years before this period to the thirty years after, there is about a 1% decline in trend US GDP. This time marked the peak of US domestic oil production. (It is also coincident with the beginning of the Reagan years, so you could argue that the drop in growth is the result of "trickle down".) The latest boom cycle again resulted in large oil price increases that forced demand reduction ahead of the financial meltdown. Only history will tell if we surpass the peak oil production achieved in 2007, but the outlook is far from certain. The economy quickly went from being supply constrained during the run up in oil prices, to now being demand-constrained due to high unemployment. Could this cyclic behavior happen once more when we finally begin to grow again? What about when solar becomes cheaper than oil ever was combined with long distance electric cars? What about when we have robots building robots building solar plants, desalination plants and pipelines, and recycling resources far faster than they've ever been recycled? Further out there is deep mining of the earth rather than just the very tip surface and utilization of other planets via cheap access to space for large industrial cargos from things like space elevators and launch loops, again aided by armies of robots building robots. I realize that is the economists dream; that the market drives technological innovation and innovation fuels growth. Smarter, better, smaller allows fewer resources to be used so we can maintain real growth indefinitely. And maybe this works... but surely only if the real costs of present and future technologies are transparent to the market - including the costs of environmental degradation. That is certainly not the case today. I'm generally bothered by a world where we play around with theories about how our basic 4% growth exponent might vary a bit because of this policy or that one, but we never question the long trend. You can't seriously argue that population can grow forever (although perhaps you did by invoking space colonization) since in a few more doubling times the mass of people would be larger than the all the biomass on the earth. 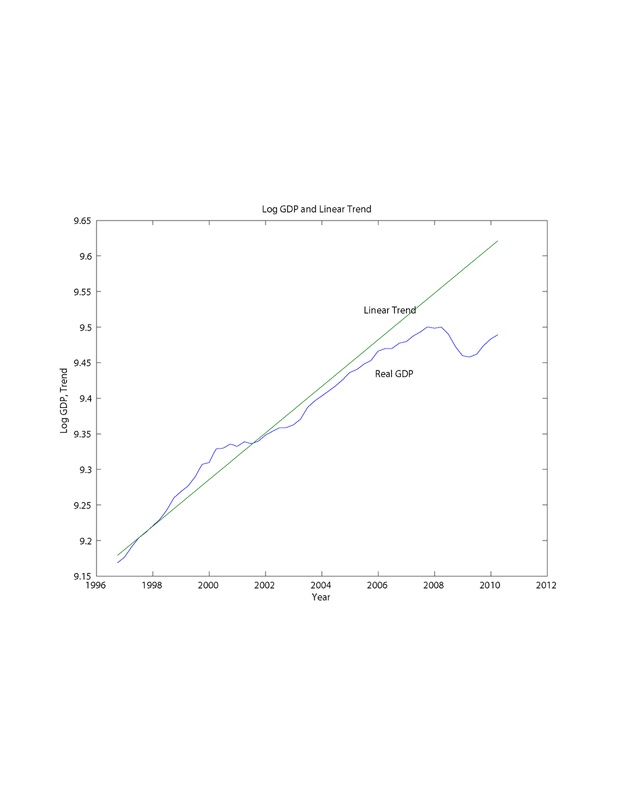 Population stagnation alone should reduce GDP growth. Exponential growth is just a way of saying that "what you make" is proportional to "what you have". For an economy, "what we have" consists of people, capital, resources, and ideas. Until recently, there were no real limits on any of these components. There are no new frontiers left on this planet where more oil, water, air, and minerals are to be found. I guess your counting on continued growth in capital and ideas to make up for stagnation in resources and people. Is there a good reason to expect that? Mainstream economists don't talk about this much. I think it is an oversight. "You have to define what you mean by growth. If by growth you mean population, more people, then Paul [Ehrlich, a biologist] is actually right. There are physical limits on how many people you can have on Earth. If we took peak population growth rates from the '70s at 2 percent per year, you can only sustain that for a couple of hundred years before you really run into true physical constraints... Now, what do I mean when I say growth can continue? I don't mean growth in the number of people. I don't even mean growth in the number of physical objects, because you clearly can't get exponential growth in the amount of mass that each person controls. We've got the same mass here on Earth that we had 100,000 years ago and we're never going to get any more of it. What I mean is growth in value, and the way you create value is by taking that fixed quantity of mass and rearranging it from a form that isn't worth very much into a form that's worth much more. A canonical example is turning sand on the beach into semiconductors." "Think about the basic science that led to the discovery of the structure of DNA. There are some kinds of ideas where, once those ideas are uncovered, you'd like to make them as broadly available as possible, so everybody in the world can put them to good use. There we find it efficient to give those ideas away for free and encourage everybody to use them. If you're going to be giving things away for free, you're going to have to find some system to finance them, and that's where government support typically comes in... Because everybody can use the idea at the same time, there's no tragedy of the commons in the intellectual sphere. There's no problem of overuse or overgrazing or overfishing an idea. If you give an idea away for free, you don't get any of the problems when you try and give objects away for free. So the efficient thing for society is to offer really big rewards for some scientist who discovers an oral rehydration therapy. But then as soon as we discover it, we give the idea away for free to everybody throughout the world"